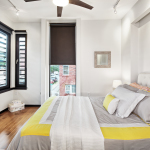 Architectural Gem in Hoboken with a Private Garage! 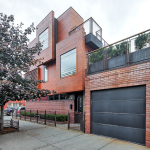 An award-winning, architecturally designed Hoboken home awaits a discerning buyer. 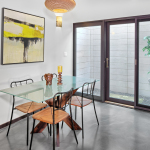 Originally designed and constructed for the architect’s own family, this spectacular residence has been lovingly cared for by its current owner. A revised vision of the traditional row house, this 3-story, “end-of-the-row” property features 3 bedrooms, 2 & 1/2 baths, a private garage and multiple outdoor spaces.The brick base of the exterior provides privacy at street level while the band of horizontal windows above allows light to flow into the living, dining and kitchen area. 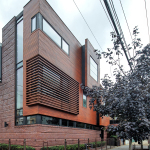 The upper two levels combine warm red cedar cladding and privacy screening and large, strategically-placed Pella windows to create a dynamic and playful facade while maximizing interior living space and function. Landscaped enclosures and Ipe-decked terraces allow for extra light, a view of greenery and provide additional outdoor living space. 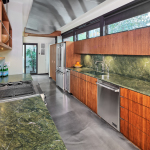 The modern and luxurious finishes are apparent as soon as you enter the home. 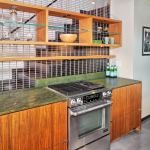 The kitchen is equipped with black walnut, European cabinets, honed granite counters and professional, Jenn-Air appliances. 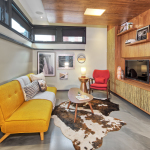 The dining area adjoins a 3-story light well and the living room features a harmonious, built-in walnut media console. 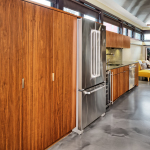 Floors are radiant-heated, epoxy-coated poured cement. A sculptural metal and Starphire glass panel stairway on the Eastern wall connects all 3 levels and provides a visual cohesion among the floors. 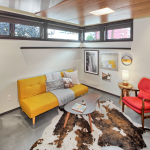 Two spacious rooms are located on the second floor and allow flexibility to be utilized as two bedrooms, or a bedroom and an office or media room. The second floor also provides a full bath and full-size laundry. Off the southern bedroom is an Ipe-decked terrace with iron railings and perimeter planters. 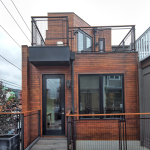 The penthouse floor master suite is fitted with a gas fireplace and French doors open to another Ipe-decked terrace. 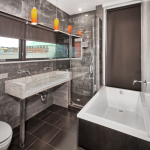 The adjoining master bath is tiled with Porcelanosa tile, complete with soaking tub, a glass enclosed shower and dual sinks. 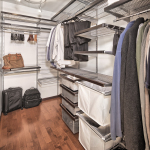 A walk-in closet with Elfa shelving provides abundant storage space. Floors throughout the upper levels are of tiger maple hardwood. There is multiple zone central air and forced air heating, custom window treatments, lighting and ceiling fans throughout. The private, enclosed garage completes the picture. 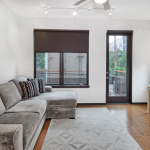 Located in midtown, this home provides convenient access to shopping, Manhattan transportation, parks the library and numerous dining options. Truly a one-of-a-kind opportunity to live in a very special, Hoboken property.